Walter “Wolfman” Washington has been an icon on the New Orleans music scene for decades. His searing guitar work and soulful vocals have defined the Crescent City’s unique musical hybrid of R&B, funk and the blues since he formed his first band in the 1970s. His tenure with Dorsey took him to all of the great music halls in America including appearances at the famed Apollo Theater in Harlem. Before he went out on his own with his Solar System band, he also did stints with acclaimed New Orleans songstress Irma Thomas as well as with the legendary jazzman David Lastie’s Taste of New Orleans band. During the 1970s, Washington began a 20-year association with one of the most important vocalists to hail from Louisiana- the late, great Johnny Adams. Dubbed “the Tan Canary” for his peerless vocal stylings, Adams was a mentor of sorts to Washington who developed his singing style while the two worked together at back-of-town clubs including a long stint at the famed Dorothy’s Medallion in the Mid City section of New Orleans. Seeing Walter “Wolfman” Washington perform with his current outfit, the Roadmasters, is akin to taking a history lesson on black music in America with the exception that sitting down and taking notes is not an option. With his breadth of experience and seemingly endless repertoire, each of his highly danceable shows is one-of-a-kind. Like the greatest jazzmen, Washington channels his everyday life into his music. Depending on the setting, the band plays the blues, R&B, soul, funk, jazz and everything in between with pure heart. Washington, like Adams before him, is a great interpreter of song. He inhabits each number whether it’s a soulful ballad or a funk rave up. His gift of interpretation allows him to bring his own spirit to the composition while always exposing the true sentiments of the lyrics to the audience. While Washington had to hone his vocal gifts learning phrasing and presence, his guitar playing has been without compare since the early days of his career. As a rhythm player he provides just the right tension to support his band members when they take their solos. But it is during his moments in the spotlight that Washington really shines. When he plays lead guitar, jaws often drop in the audience as he spins out highly nuanced solos that build in intensity or spiral around a central theme. Of course, that’s before he even begins to play with his teeth! 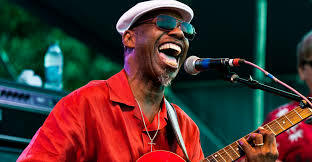 Walter “Wolfman” Washington has earned numerous accolades over his long career, but he is not one to sit back on his laurels. He maintains a heavy schedule playing with the Roadmasters as well as with his trio, the Chosen Few. As if that were not enough, he also recently began a successful collaboration with some local jazzmen including the trumpeter James Andrews. This entry was posted in Past Productions, Roster, template, Upcoming Tours.